The BBC's Paul Danahar reported on the aftermath of the cyclone in Burma before flying to China to cover the Sichuan earthquake. Here he compares the two disasters, and the response from both governments. It is the stench of death that distinguishes these two disasters. It still blows across the vast flooded plains of the Irrawaddy delta. It is not a faint smell that slowly creeps up on you. It just suddenly hits you in the face, filling your mouth and nose, smothering your senses. And it assaults those in the delta even now, more than two weeks after the cyclone smashed into the coastline. But in Sichuan province, in neighbouring China, the air is still breathable. Death is being swept away. 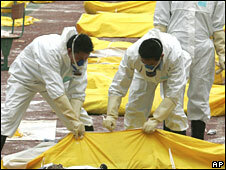 Corpses are being collected and buried. Families, where possible, are receiving the grim comfort of a body to grieve over; a ritual to mark the passing of a loved one; a point from which to try to rebuild what remains of their lives. In Burma the bodies of many of those lost in the cyclone receive attention only from the birds. Five days into the earthquake in China, the trucks of aid and relief supplies were too many to count. At the same stage in Burma I counted only two. That was during a whole day of travelling along the main highway into the delta from the former capital Rangoon. In Burma people sat in the wreckage of their homes. Bloated, rotting corpses floated around the rivers and inlets. Often help was not on the way. The generals in Burma chose not to save lives. It was their decision to make. They could not control the cyclone, and they could not cope with the disaster. But they still controlled borders and, as they have for decades, they thumbed their noses at influence from the outside world. Even when, in this case, that influence was undisputedly for the good of their people. China was once like this. Thirty-two years ago the government of Chairman Mao reacted in the same way after the Tangshan earthquake, close to the capital Beijing. At least 250,000 people died. Under-resourced and overwhelmed by the natural calamity, the government of China literally buried the evidence of their incompetence. In a phrase echoed recently by Burma’s military junta, they announced the beginning of reconstruction before the relief effort had really begun. Bulldozers consigned the true scale of the disaster to the speculation of future historians. The Chinese reaction this time could not be more different. It has been a model of disaster relief. There have been recriminations about why so many buildings, particularly schools, collapsed so easily. There are accusations that corrupt local officials conspired with unscrupulous builders to construct structures that turned into death traps. But there is a distinction that must be made in modern China between the local administrations and the central government. For while some local officials may prove to have blood on their hands, the Chinese government has done all that could be expected of it. The generals in Burma find themselves accused of an "inhuman" response to their disaster, bordering on a "crime against humanity". In contrast China has found itself in the unusual position of being showered with international praise, both for its reaction to the disaster and the openness with which it has allowed the details to be reported. The government of modern China has thrown in every resource at its disposal and it has been prepared to have its efforts judged openly. And, unlike the generals across the border, they have nothing to be ashamed of.